One of the recurring themes that we hear from schools is the challenge of students not being motivated to achieve to their full potential. The anecdotes are supported in academic studies. Researcher David Goslin estimates that 75% of students are just there to “get by” in school or are not engaged at all. Hobsons is committed to partnering with schools to solve this issue by helping students connect their learning in the classroom with their lives today and in the future. We are excited to introduce a new assessment from a global organization that has been working on the issue of motivation and engagement for over 50 years. Gallup has done extensive research on what makes individuals and organizations successful. All the research points in one direction: individuals thrive when they focus on their strengths, rather than trying to fix weaknesses. In response, Gallup developed the hugely popular book and assessment, StrengthsFinder 2.0. Over 8 million people have taken Gallup’s strengths assessments to date. Several years ago, Gallup introduced “StrengthsFinder for youth”, an assessment called StrenghtsExplorer® to help students in grades 6-10 identify their emerging talents. The video highlights the experience of Carson Middle School in Fairfax County, Virginia with StrengthsExplorer. The results of Gallup’s research with students are compelling. In one study of 1,648 students at an urban high school, half the students took the StrengthsFinder assessment and received feedback from teachers on their strengths. The other half of the group didn’t take the assessment. After one semester, students who took the strengths assessment had significantly lower instances of tardiness and absenteeism, and higher GPAs. Hobsons is pleased to introduce Gallup’s StrengthsExplorer for all Naviance schools. Previously only available as a stand-alone assessment, StrengthsExplorer identifies each student’s three strongest innate talent themes, such as Confidence, Dependability, or Future Thinker. Once understood, these talent themes can be aimed at success in school and post-secondary attainment. Gallup StrengthsExplorer in Action from Hobsons on Vimeo. 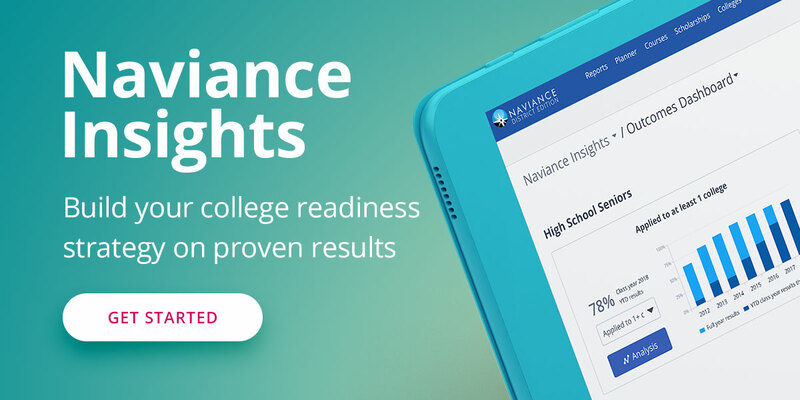 Since focusing on strengths doesn’t end with an assessment, Naviance educators can find strategies for incorporating strengths into the classroom in the Naviance Network Help Library. How has focusing on student strengths helped students in your school?